In 2005 it looked like astronomers had found a new planet, one somewhat larger than Pluto. But instead of gaining a planet, we lost one when both Pluto and the new object got listed as dwarf planets. (1) Mike Brown, Chad Trujillo and David Rabinowitz discovered the “Tenth Planet” at Palomar Observatory in California. They photographed Eris in 2005, but only discovered it in their images two years later. The Minor Planet Center gave it the temporary number 2003 UB313. 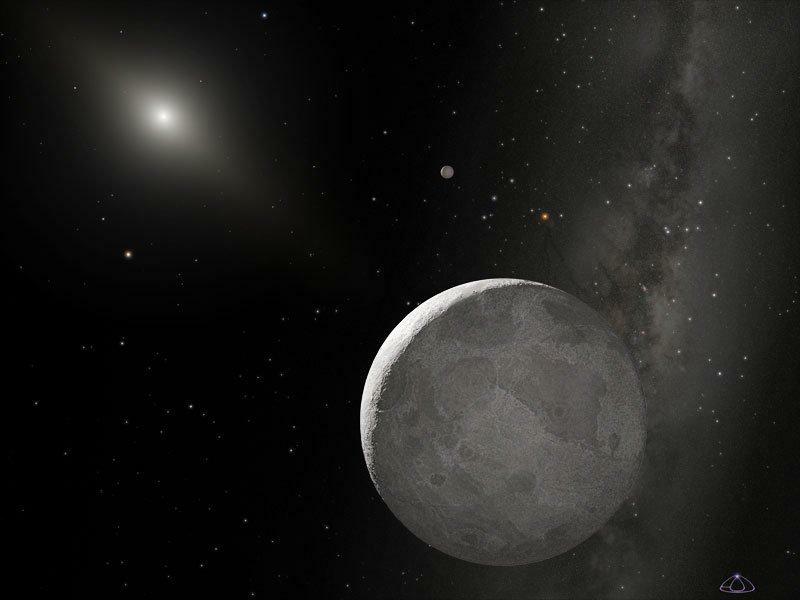 At first it looked as if it were larger than Pluto, so NASA announced it as a tenth planet. (2) Eris has a moon. Mike Brown discovered Eris's moon. It's 37,350 km (23,200 mi) from Eris – that's less than the distance around Earth's equator. The moon orbits Eris in about 16 days. No one knows how big it is – astronomers estimate that it's between 100 km (60 mi) and 250 km (150 mi) in diameter. (3) The discovery team called the “planet” and moon after characters in an American TV series. Even if you discover something, you can't just give it any name that you like. The discovery has to be confirmed, and the International Astronomical Union (IAU) has rules about the names for heavenly bodies. But the discovery team didn't much want to talk to each other about “UB313” and its moon “S/2005 (2003 UB313) 1”. So they called the “planet” Xena, from Xena Warrior Queen, an American television series. The moon was Gabrielle, after Xena's sidekick. (4) The discovery of Eris made the International Astronomical Union (IAU) decide that it was time to define what a planet is. In August 2006, the IAU did define a planet. Neither Pluto nor Eris qualified. They were put in a new class called dwarf planets. Some people are still unhappy about it. (5) Distant object 2003 UB313 officially became the dwarf planet 136199 Eris. The dwarf planet got its permanent number, and the discovery team chose the name Eris. In Greek mythology Eris was the goddess of strife and discord (disagreement and argument). The moon was named Dysnomia, after Eris's daughter, the spirit of lawlessness. 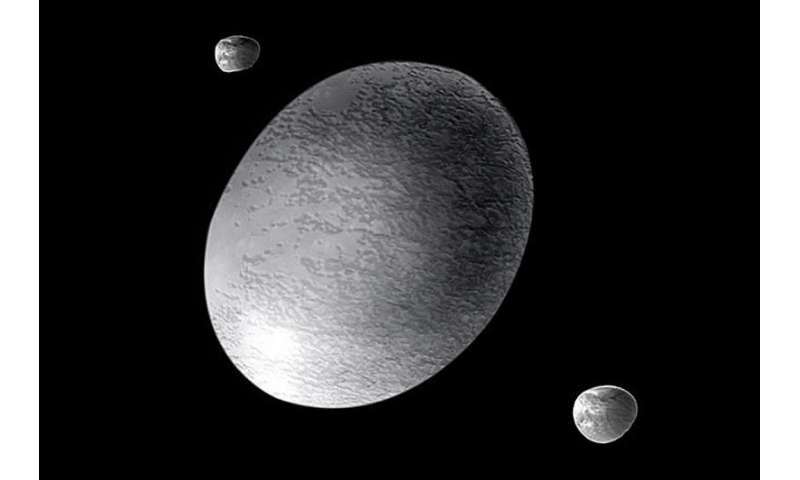 (6) Eris is a tiny bit smaller than Pluto, but it's much heavier. Eris's diameter is only about 50 km (30 mi) less than Pluto's. But Eris's mass is 27% bigger than Pluto's, so Eris is made of heavier materials. It must be mostly rock with a layer of ice around the outside. (7) Eris isn't in the Kuiper Belt – it's farther out in the scattered disk. The Kuiper Belt is like the asteroid belt, but it's much wider, much farther away, and made up of icy objects instead of rocky ones. It's where Pluto is. The scattered disk contains objects that Neptune's gravity kicked out of the main Kuiper Belt in the early days of the Solar System. They are in very stretched-out orbits at a steep angle to most of the other Solar System orbits. (8) A year on Eris is 558 Earth years. Days on Eris are longer than ours – 26 hours. A month is just over half the length of an Earth month. But the years are very long, and Eris has an orbit that's very stretched out. When it's closest to the Sun, it's 38 AU away. (AU=astronomical unit, the distance from the Earth to the Sun) That means it can be closer to the Sun than Pluto is, but that's still 38 times farther away from the Sun than Earth is. The farthest point of Eris's orbit is 98 AU from the Sun. In 2015 Eris and Dysnomia were over 95 AU from the Sun. 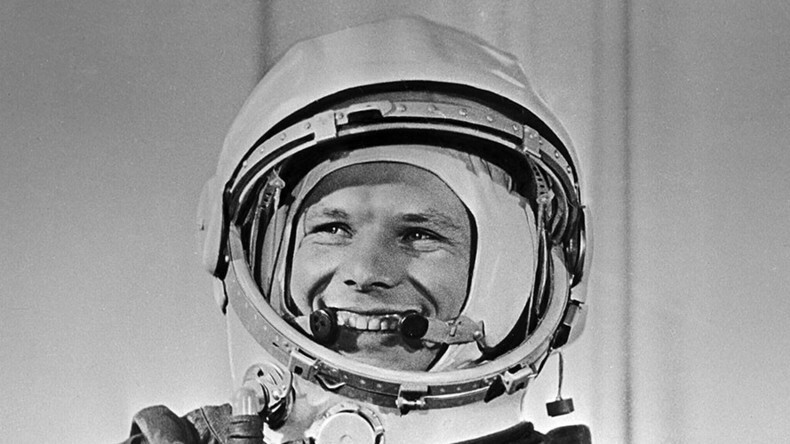 That was farther away than any other known Solar System object, except for some comets. But in November 2018 we learned of an object called VG18 discovered at over 100 AU. (9) Eris is cold. Really cold. Astronomers don't know the exact temperatures on Eris, but even when it's closest to the Sun, it's about -217°C (-359°F). The lowest temperature ever recorded on Earth was −89.2°C (−128.6°F) in Antarctica. That's tropical compared to Eris. (10) Eris has an atmosphere, but it's now on the ground. Eris is so far from the Sun that the atmosphere has collapsed onto the ground and frozen. It now covers the dwarf planet in an icy glaze. It makes Eris very shiny – that's why it's almost as reflective as Saturn's moon Enceladus. In a few hundred years the dwarf planet will be closer to the Sun. Then it will get its thin atmosphere back again.